LANSING — Lawmakers leaving the Michigan Legislature would have to wait two years before becoming lobbyists under bills being prepped by a Democrat and a Republican in the state House. 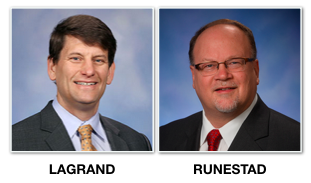 Rep. David LaGrand, a Democrat from Grand Rapids, and Rep. Jim Runestad, a Republican from White Lake, say they plan to introduce the package soon after the House returns from spring break on April 19. If their bills become law, Michigan would join more than 30 other states in requiring some type of “cooling-off” period before lawmakers who leave at the end of their terms can begin lobbying their former colleagues, according to the National Conference of State Legislatures. Currently, Michigan delays the start of a lobbying career only for lawmakers who resign from the Legislature before the end of their terms. Those who resign have to wait until the terms they were serving end. But lawmakers who depart because of term limits or an election loss are free to become lobbyists just days later, which happens. For example, former Michigan House Speaker Rick Johnson, a Republican from LeRoy, served in the House from 1999 through the end of 2004. He registered as a lobbyist on Jan. 4, 2005, according to state records. More recently, former Rep. Frank Foster, a Republican from Petoskey, left the House at the end of 2014. He registered as a lobbyist for Public Affairs Associates on Jan. 15, 2015. In January, MCFN and Bridge Magazine published a joint report on the quick move many lawmakers have made to lobbying in Michigan. The report found 44 former state legislators among the more than 1,000 registered lobbyist agents in the state. Of the 44, 28 — 63 percent — registered as lobbyists within a year of leaving their posts in the House or the Senate. Twenty-five registered as lobbyists within six months of leaving office. Since then, another has joined the list. Former Rep. Joel Johnson, a Republican from Clare, left the House at the end of 2016. He registered as a lobbyist for Mid Michigan Community College on Jan. 25, 2017. Runestad introduced a bill during the 2015-2016 session that would have brought an 18-month “cooling-off” period. However, it never got a committee hearing. This year, he’s working across party lines with LaGrand on a new package. A bill to be sponsored by Runestad would institute a two-year “cooling-off” period for all lawmakers leaving the Legislature. LaGrand’s bill would increase the waiting period to three years for lawmakers who served as committee chairs. The bills don’t have numbers yet because they haven’t been introduced. Runestad said his goal is to combat perceptions that certain things happen in Lansing for the wrong reasons — like a term-limited lawmaker’s desire to get a job as a lobbyist. LaGrand said currently, under term limits, some lawmakers come to Lansing, serve the maximum six years in the House and view lobbying as a logical next career option. Opponents of the idea of a “cooling-off” period have argued that former lawmakers should be able to use their legislative expertise after their time serving the public is over. Former House Speaker Lew Dodak, now a lobbyist, said in a recent interview that he didn’t see any inherent ethical conflict with legislators becoming lobbyists. In the fall of 2015, the Center for Public Integrity ranked Michigan 50th out of all 50 states for the systems in place to deter corruption in state government. One of the many metrics that Michigan got low marks for was not having a “cooling-off” period. The Center for Public Integrity report also dinged Michigan for being one of three states that don’t require lawmakers to file personal financial disclosures and for being one of two states that exempt both its governor’s office and Legislature from the Freedom of Information Act (FOIA). Lawmakers have proposed bills to institute “cooling-off” periods every session for the last decade. A majority of current Michigan Senate members have co-sponsored “cooling-off” period bills at one point in their legislative careers. And as a candidate for governor in 2010, Snyder himself proposed a two-year “cooling-off” period. If the bills can get through the House, LaGrand noted that it will take only 20 yes votes to get them through the Senate and he said he would attempt to have one-on-one conversations with enough senators to gather the needed support.